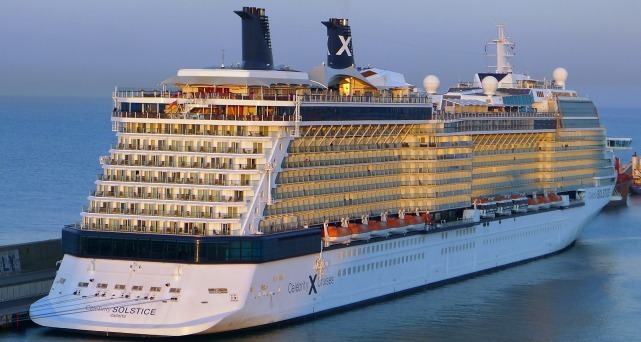 The Celebrity Solstice Cruise Ship was the first ship in the ‘Solstice-Class’ which are owned and operated by Celebrity Cruises. Launched in 2008, the luxurious cruise ship is designed with exclusive furniture and plush interior decor for elegance and sophistication. Passengers have a choice of luxurious staterooms and a wide choice of amenities, features and entertainment for the ultimate cruise. Celebrity Solstice has a capacity for 2,850 passengers and 1,150 crew members and travels to various destinations throughout the year. From summer 2013, the ship will be based in Seattle and sailing to Alaska and Special Wine Country Cruises. Then in the winter the ship will be transferred to Sydney, Perth and Auckland where she will offer cruises around Australia, New Zealand and The Pacific Islands. Passengers on-board Celebrity Solstice have a diverse choice of dining rooms, restaurants, cafes and snack bars to choose from. The main restaurant offers the ultimate in style and sophistication with beautifully presented dishes from around the world and a menu which changes daily. The Silk Harvest Restaurant offers an alternative dining experience with a taste of the Far East, this family style restaurant with friendly staff and stunning ocean views will be sure to be a firm favourite with all passengers. For less formal dining, guests will find a whole host of outdoor restaurants, cafes and snack bars across the ship with freshly cooked food available from early morning, until late at night. The Patio on the Lawn Restaurant is great for al-fresco dining under the moonlight whilst enjoying stunning sea-views beside the luscious green grass lawn. Day or night, Celebrity Solstice has a host of bars, lounges and clubs for passengers to relax and unwind in. Don’t miss a visit to the exclusive Martini Bar with a wide range of worldwide vodka’s on offer, comfortable seating and all the latest tunes. The Sky Observation Lounge is the perfect place to catch up with friends and enjoy an exotic cocktail or iced cold beer. At night the lounge hosts various live music, dancing and fun themed nights for guests to join in with. Whatever your interests or tastes, Celebrity Solstice will be sure to have something to push every passengers button. By day, the ship has numerous pools, sporting activities, fitness centre, spa, beauty saloon, kids activities and much more to ensure there is always something going on. By night, live shows, magic acts, cabarets, dancing, live music and much more are on offer in the numerous bars, theatre and lounges across the ship. For those who want to chance their luck a visit to the deluxe casino with many exciting games is a definite must, with slot machines for beginners and Black Jack, Poker and much more for the more experienced.